AMIE in Electronics & Communication from Institute of Engineers India(IEI), Calcutta, in year 1995, ME from Bangalore University, in Power Electronics in year 1999 and currently pursuing Ph.D in the area OFDMA from Andhra university, Visakhapatnam, India. 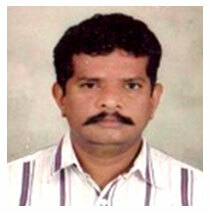 Worked in various Engineering Colleges at various levels. Has 18 years of teaching experience. Published 1 paper in international journal, 10 papers in various international & national conferences. Member in Professional bodies ISTE, IEI (I). Has good teaching experience specialized in power electronics, satellite communication, electronic circuits and signals and systems. Prepared AEC lab manual and Power Electronics Lab manual. Member in anti ragging committee and cultural secretary in college level.